In downtown Phoenix, development is looming at seemingly every corner (and at our offices on Roosevelt Row, it literally is). Apartments, condominiums, mixed-use, and entertainment venues all sprouting up simultaneous, one might wonder what could set a development apart? “Great architecture in a great location at an attainable price,” says architect and developer Jason Boyer of his flagship development project. With so many attempting to enter the market as “upscale,” artHAUS is aiming to cater to downtown’s growing middle class. Units of 560-1900 square feet come in at $160-$511K across 25 units, creating a wide range of new-build product in a concise site, walking distance from Arizona Opera, Phoenix Art Museum, Valley Metro light rail, Heard Museum, Hance Park, ASU, and much, much more. It is that very local context the development is aiming to highlight most. Just two weeks ago, Local First was able to attend the new modern condominium development’s grand opening celebration. More than just staged urban dwellings, the event was a feast for those seeking the present state of localism in and around central Phoenix. Boyer rattled off the local partners engaged in the project: Modern Manor (model unit staging), Ocotillo, Mamma Toledo’s, The Velo, Press Coffee, Velocity Group Realty, Sutra Yoga, Phoenix Ale Brewery Central Kitchen, Symmetry Construction, Artemis Realty Capital, Café at the Phoenix Public Market, and his own architecture firm, creating a marquee example of local sourcing. From providing the snacks, to marketing the project, to serving as real estate advisors, to design and construction, everything possible was kept in the state of Arizona, showcasing the capabilities of a locally-centered supply chain. From day one the project set out to build relationships with its neighbors that surround it. 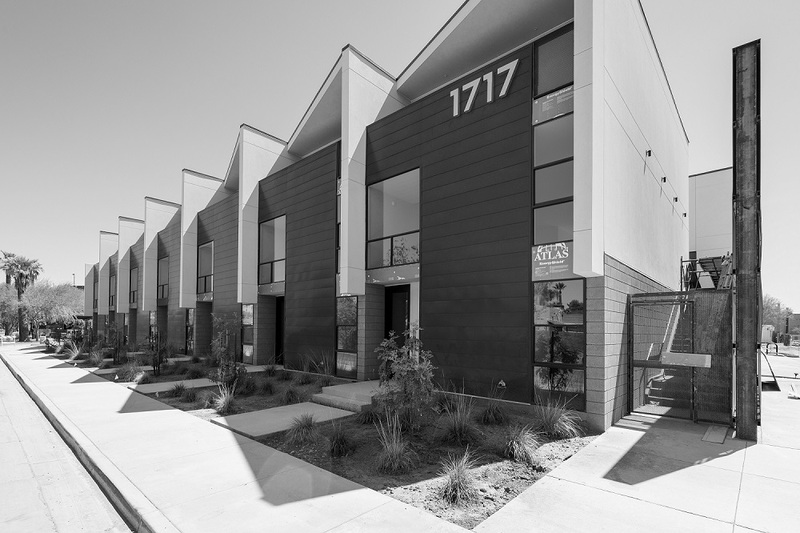 The developer chose to construct on a vacant lot at the crossroads of downtown and midtown Phoenix in a way that required zero variances, while maximizing the buildable footprint and complementing the adjacent Willo Historic District in walkability, scale, and community building. artHAUS’ first residents will move in this July. The Velocity Group is marketing the project. The sales office is located on site at 1717 N 1st Avenue with office hours W-F 12-5pm and Sa/Sun 11-3pm or by appointment. For more information, or to book a tour, contact 480-235-4312 or visit VelocityGroupAZ.com.